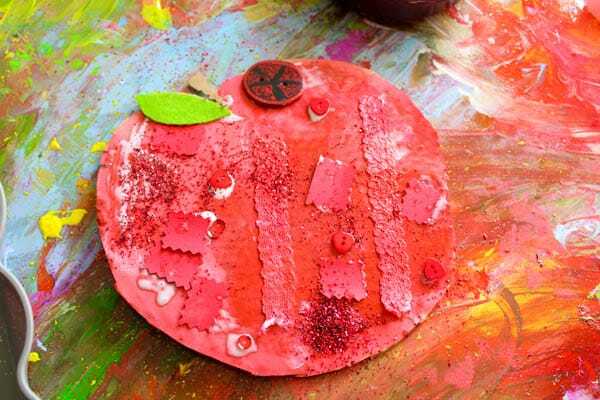 Apple season has arrived and today I have an incredibly easy Apple Collage Craft to show you that’s perfect for very young children and preschoolers. 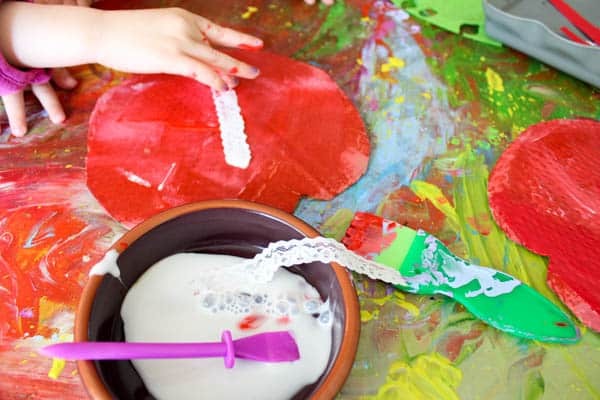 Offering a fine motor work out with lots of painting, sticking, cutting and gluing, with the added benefit of encouraging children to explore and create with different textures within the theme of ‘the colour Red or Green’. 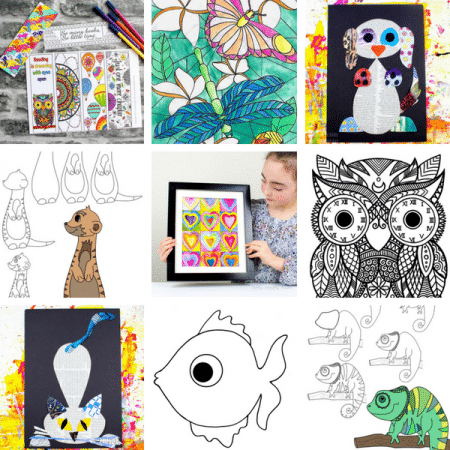 This is a great introduction into mix media art concepts, enabling children to use their imaginations to creativity reuse and recycle normal household materials within their art. See our disclosure policy for more information. 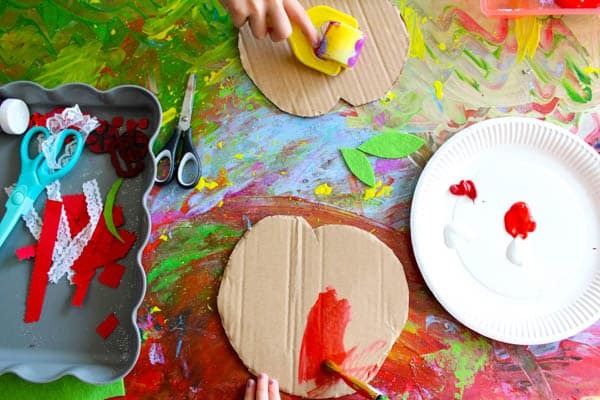 Begin by creating an Apple Canvas by cutting up an old cardboard box. The Apple could be as large or as small as you like! Paint the Apple Red, Green or a mixture of the two! 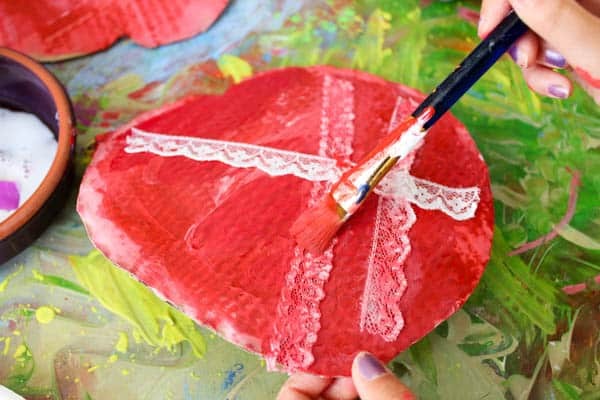 I offered the girls a variety of tools to paint with including a paintbrush, roller and foam shapes to create interesting shapes within the paint. I also supplied the girls with white paint to give them the opportunity to explore red light and dark shades through colour mixing. My eldest came up with the brilliant idea to stick lace onto her apple an then paint the lace red with a roller. Creating some gorgeous texture and depth to her apple. 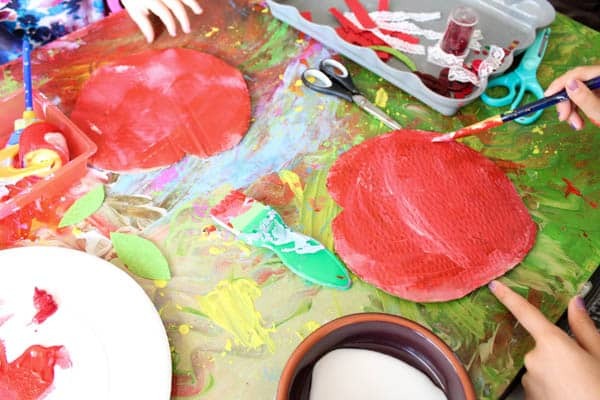 The girls continued to layer their apples with various red items, including sequins, buttons, paper and glitter. Finishing up with a big green felt leaf and a cardboard stork! The Easy Apple Collage Craft is now finished! 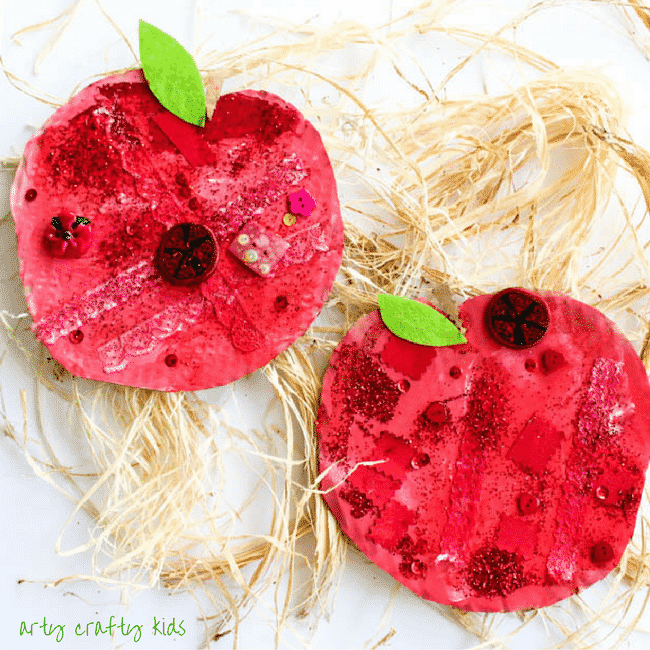 And as easy as that, your kids should now have a gorgeous collaged apple all of their own! For more apple crafts, you might be interested in our Handprint Apple Tree and Easy Peasy Cardboard Tube Apple Trees. 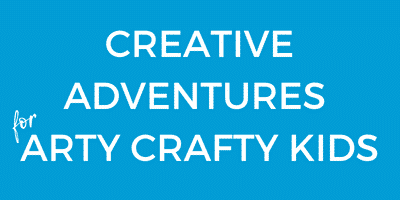 Alternatively, we have lots of Autumn Themed Crafts I’m sure you will love!